As it has grown colder in the last few weeks, I have been thinking a lot about my problem with winter accessories. You know, once I get an idea in my head, I cannot get rid of it! I have sketched, swatched, and stashbusted – finally, I have a plan! I’ll share more once my yarn arrives. In the meantime, I can show you what did not work, for one reason or another. 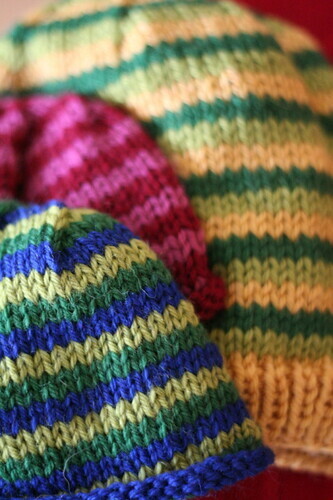 Every winter, I fall into a stashbusting hat binge. So far, I’ve managed one adult hat and two newborn caps. I rediscovered why people make hats: they’re such quick knits! It seems unfair that I have to learn this lesson every year. I think there will be a few more of these, if only because they knit up so quickly and effectively use up annoying scraps lurking in my stash. This project came closer to satisfying my criteria for the ultimate winter accessory knitting; however, the gauge was all wrong. Still, it’s a good prototype for what will come. Finally, speaking of winter accessories, I have a new pair of mittens in Interweave Knits Holiday 2009! The magazine will not be available until late October, but the preview was posted on Monday. Love the tapestry mittens! As I was browsing the preview I came across them and said ohhh I like those,they kinda remind me of Elinor’s mittens….then I scrolled back up and saw your name beside the pattern. Lovely lovely! 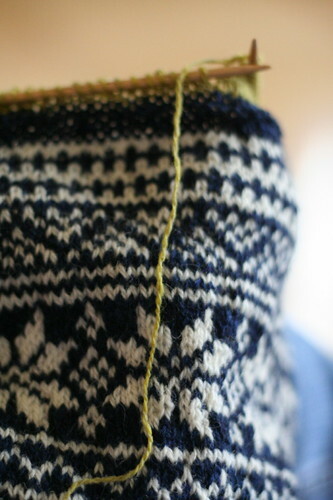 I REALLY need to learn fair isle. Those are amazingly gorgeous mittens (as are all of your projects!). I’m looking forward to the pattern. Your colorwork is always so beautiful! I’m intrigued by the mystery blue and white project in the middle. And I can’t wait to get that edition of Interweave. Congrats on the pattern in INterweave. I was eyeing those as one of the patterns that would make me purchase the magazine. Every year I make a hat for my niece who lives in Alaska, and every year I wonder why I don’t make more hats, you are right, they are very satisfying knits. I love those mittens!! They look to be exactly what my brain has been trying to visualize for mittens for this winter so I can’t wait to get a copy of the magazine! Congratulations! Because what my San Diego lifestyle really needs is more mittens . . .
Elinor — congrats on getting such a lovely pattern published! I’m wondering, are the mittens lined with the purple 150? Can’t wait to knit these up. I loved seeing the Tapestry Mittens in the preview last week! You have been so prolific lately! Congratulations on the pattern! They are gorgeous! Oh wow! The mitts are perfect. I had seen them on someone else’s blog, but I didn’t realize they were your design. Congratulations! I knew there was a reason I loved those mitts when I first saw them – they’re yours! Can’t wait to make them. Wow, I love the palm of those mittens. Congrats! 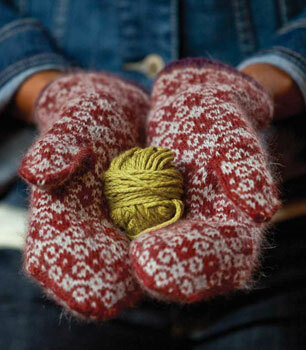 Those mitts might just have been my favorite project in the issue – nice job! i love the pattern in the scarf. and those mittens are amazing! like little works of art for your hands. those mittens are beautiful – can’t wait till the issue comes out! I’m so in love with the mittens…I saw the preview earlier this week and am buying yarn for them at Rhinebeck tomorrow! Thanks for another beautiful pattern! The mittens are so great!! I am going to have to make some little hats too! I just don’t know anything about newborns and how much they wear them, but I guess it can’t hurt! The Tapestry mitts are fantastic!! I love the mittens–I will be waiting for the magazine to come out! Congrats on your pattern in Interweave! It looks like a fantastic and beautiful pattern–I think I might need to make them. Congratulations. The mittens are fantastic! I could never knit like that, but I would die for at pair of the red ones…hmmmm…. Congratulations on the publication of your mitten pattern! They are especially lovely and the colours and wonderful! I’m so behind on my blogreading (thanks to Rhinebeck), but I have to congratulate you on the Tapestry mitten pattern! They’re gorgeous! I really loved your mittens! They made me want to take up the needles and knit them now – and I have only ever made a pair for middle school home ec. project about 20 years ago! Could you suggest any yarn substitutions – basically, I am looking for something that would be more or less readily available in Europe. I have found no Classic Elite stockists online so far. Many thanks in advance for your help!